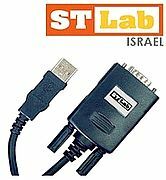 the USB to serial cable provides a simple and easy way to connect universal serial bus and serial port interface. with the USB properties of plug and play & hot swap, end users can easily connect any serial devices to computer via the cable. it is the most convenient way to connect cellular phone, modems, ISDN terminal adapter and other serial peripherals. the software driver is well written that most serial peripherals can be configured as if they were connected to the conventional serial ports without any firmware or hardware changes.